The English Peasants' Revolt of 1381 erupted suddenly, but not without warning. The seeds of dissent fell from the tree that was medieval society itself and were watered by the continuous oppression of the poor in towns as well as the countryside by those in power. Artisans, parish priests, poor city workers, and even small traders rose with the peasants in their call for the abolition of feudal obligations (serfdom) and the resulting economic/social injustice they had endured for so long. The wide variety of rebels indicates the tremendous level of dissatisfaction with the corruption in government and the confines of 14th century English society; this dissatisfaction indicates that the people were thinking and questioning instead of meekly accepting their role as a human beast without hope for a better life. The Revolt may have failed in its immediate goals, but it served as a link in the quest of the poor for emancipation from servitude, controlled wages, and unfair taxes. Their expression of concerns, desires, and demands was an example in courage, courage to challenge the strict boundaries of society. Their society could be divided into three main segments: warrior, priest, and peasant (free and unfree). The warrior class included royalty, nobles, and knights who had enough money to own armor, weapons, and horse for warfare. The priests were separated into the officials and the lower clergy, roughly parallel to the noble class and the peasantry, respectively. The Archbishop, bishops, and abbots were ecclesiastic barons with great temporal power while the poor parish priests were only a little more literate and financially secure than their parishioners. The peasants were mostly unfree, bound to manor, lord, or soil by labor by service. However, some became free by buying their freedom. The merchant class and the urban industrial workers existed somewhere between the peasants and the nobles; they were free but often survived as poor day-laborers and were frequently at the mercy of the abbots, their landlords. They suffered from the same unequal system of taxation as the serfs in the fields; consequently, they revolted with the peasants in the summer of 1381. Life for the revolutionary peasants was structured by feudal ties and obligations. The villein was tied to the soil until he could buy his freedom. He lived in a wattle and daub hut with his family and animals on a floor of mud. Work began at dawn on his few (often separated) strips of land; he was obligated to work on his lord's land three days a week, tend and shear his sheep, feed his swine, and sow and reap his crops. Even the peasant's private family life was regulated: "villeins may not marry their daughters nor have their sons tonsured without the personal approval of the bailiff." <2> The reeve, a village official ostensibly elected by the people, usually sided with his superiors instead of administering true justice for the peasant. The peasant and his family were at the lord's mercy every day of his life and even after his death. The peasant had to take his grain to the lord's mill where his time was wasted and he was robbed by the lord's bakehouse. Ale was the primary drink due to the dangers of the water. The lord took a percentage on all brewing, and the serf had to pay for his quota -- even if he refused to drink it. The peasant was fined twice, though, at death: once by the lord and once by the Church. The lord would take the family's best animal as repayment for military service that the peasant could no longer provide and armor the lord supposedly loaned him. The Church would take his second best animal since the peasant probably had not given enough to the Church in tithes during his life. This would leave the family ruined, but starting over was better than the damnation that the Church promised if this last tithe was not made. Is it little wonder that men began to grumble and question? Men were starting to resent the restrictions they were forced to endure. The years after the Statute of Laborers were filled with military defeats, financial crises, and governmental corruptions which increased the peasants' growing antagonism. The Hundred Years War left the government with a drained treasury and Edward III's continuous demands for economic support angered his subjects. Public confidence in his government was plummeting as he grew weaker and became easily manipulated by unpopular advisers, especially John of Gaunt. The 1371 Parliament was called for fear of revolt among merchants in London and Norwich. At this time, there was the substitution of lay for clerical ministers of state. It was the bishops versus the financiers. The fact that England's forces had been driven back and her fleet did not sail hurt commerce. Financiers engaged in tricks in order to maintain profits. for example, men like Richard Lyons, a financier, would buy the nation's debts at a discount buy pay themselves back at face value. The Good Parliament of 1376 considered 146 Commune Petitions of complaints ranging from abuses of local governments to the number of Church holdings to the jurisdiction of household courts. In short, it denounced the corruption of Gaunt and the administration which condoned actions by men like Lyons. The Parliament was led by Peter de la Mare, and it refused to grant further funds until the nation's grievances were satisfied. More importantly, it condemned the king's advisers for the royal poverty, thus for the needed increase in taxes. Gaunt agreed to any changes deemed necessary. It is important to note the Gaunt's alliance with Lyons was a political rather than financial consideration since Gaunt wanted to break the temporal power of the clergy with the merchants and financiers. By 1377, the problems of government were inseparable from those of finance, especially of the war. Consequently, a fourpence poll-tax was levied that year. A tax proportional to wealth was passed in 1379, but it failed. The need for funds was greater than ever, and this led to the revival of the poll tax in 1380. The Parliament of 1380 roused people to action against the long history of oppression. The new poll tax was set at I shilling. As the name implies, a poll tax is a tax per head of the entire population. The exemption age was raised to fifteen years of age, and no man and wife would pay more than 20s. or 4d. However, Is. was the monthly wage of a married man with a family. The average income for carters, ploughmen, and shepherds, was 13s. 4d. per year. The major objection to the tax was that it was not graduated like the 1379 poll tax and that it was three times as that of 1377. In fact, the poll tax was a substitute for old taxes on movables -- taxes on property not humans. <4> It was an attempt to push greater burden on the poor, and they were becoming more and more hostile to the government making these laws. Attempts to enforce the Statute of Laborers or the Poll Tax were futile. For example, weavers, filers, house painters, and tailors were so well organized that they earned two or three times the amount established by law. On the manors, lords tried to enforce the law with "fire, imprisonment, pillory, stocks, and ducking-stools" to keep the peasant on the manor. <5> The lawyers codified customs, services, dues, and obligations, but the serfs refused to succumb to them: "Runaway serfs and laborers preferred to face death so long as, for a time, they might be free." <6> The conflicts in society were expanding to include peasant against lord, workman against employer, people against law, and townspeople against abbeys. The list of complaints was growing also at this time: the corruption of the royal court, the selfish councilors, the ruthless churchmen, the rapacious merchants and monopolists, and the mismanaged war against France. The peasants had not formed a revolutionary doctrine, only the ideas of freedom, respect, and fairness in their attempts to support themselves. On March 16, 1381, John Legge urged Parliament to create a new set of commissioners to compare tax lists to the actual population and compel payment. The results of the study show the widespread evasion: 8,000 names were absent from tax rolls in Norfolk and 13,000 in Suffolk. Throughout April and May, sullen resentment grew into open protest which exploded into large uprisings. Kent and Essex were the first to revolt. Between May 31 and June 1, the men of Essex gathered at Brentwood, Baddow, and Colchester. By this time the news reached the king, the revolt was under way. On June 2, the chief justice of the common pleas, Sir Robert Belknap, arrived in Brentwood to summon jurors to indict the rebels. However, the commons refused and made him take an oath not to attempt such a task again. By this time, Essex was in full revolt, Brentwood was in the hands of the commons, Kent was in an uproar, and Canterbury was agitated. The first incidence of property destruction occurred on this same day. Abel Ker of Erith led an armed band into a monastery at Lesness, forced the abbot to swear an oath, probably to "King Richard and the true Commons" which indicated communication among rebels and a plan to force the oath. 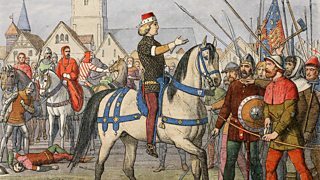 In fact, a conference was held from June 2-4 at Barking with Abel Ker, Jack Straw, Thomas Farringdon, and Wat Tyler -- some of the leaders of the Revolt. They began to formulate their demands and hope for a better life as a result of the abolition of serfdom. One of the leaders, Robert Cave, issued a statement of purpose on June 5 at Dartford. The rebels stood for "King Richard and the true Commons." There is no evidence of a class struggle in the Revolt: wealthy peasants were among the insurgents, and the rebels were not anti-nobility. <10> Rather, the rebels oppose the corruption and oppression they witness every day among specific government officials. They wanted to reform government and abolish the feudal system. Wat Tyler was selected as their primary leader at this time, but other than his actions in the Revolt, very little is known about him. He was probably a tiler, but surnames had ceased to be true indicators of profession by this time. However, he was probably well known because "no 'adventurer of unknown antecedents' would have been chosen and obeyed by commons of half a dozen counties . . ." <11> Other leaders included John Hales of Malling (chief leader in Kent), Alan Threder, William Hawler, and John Ferrour. The Revolt was taking shape. Companies were announced, and a plan of campaign revealed. The rebellion spread quickly in Kent between June 8 and 9, indicating that men were waiting and could work to some deliberate purpose against the incompetent and oppressive councilors, church, law, and serfdom. The pattern of destruction was established early. Houses of lords were attacked and manorial documents, documents of slavery, tax rolls, and judicial records were burned. This is significant because these documents registered the rights of the serfs and tenants as well as obligations, thus showing their determination. They broke open jails, castle dungeons, and dungeons in bishops' palaces. Everywhere, they forced gentlemen to take the oath. Tyler led his men to Canterbury on June 10 and burst in during the High Mass. They demanded that the monks choose a new Archbishop from among their ranks, calling the standing Archbishop a traitor. Tyler's men sacked the castle and Archbishop Sudbury's palace. Canterbury was under control of the Commons. 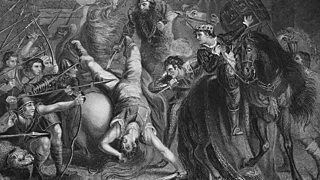 Unjust officers of the government were attacked: John Ewell, escheator of the county, was beheaded; John Sewell, the sheriff, saw his manor looted by the rebels; Sir Robert Hales, treasurer, witnessed the destruction of his house. Landlords suffered also; they were forced to give charters of freedom and leases to their former serfs. The Essex men began to march to London on June 11, led by Thomas Farringdon, Henry Baber, Adam Mitchell, and John Starling. The Kentish men left Canterbury for London at a specific time so the two marching armies would coincide. By June 12, the men of Kent were encamped on Blackheath and the men of Essex at Mile End. To the South, the rebels numbered 30,000 with the same number to the East. Within London, there were between 30,000 and 40,000 sympathizers. Mayor William Walworth told the rebels to disperse but was ignored. Meanwhile, access to the city over London Bridge was assured by Alderman John Home. Sympathy for the rebels was growing. The Court was unable to organize a defense against the rising because it had no standing army and no regular police force. As a result, they could only hide in the Tower, pray, and plan a strategy as they tried to shake off the shock. Richard had gained the throne in 1377 at the age of ten, and his minority paralyzed the government due to the lack of a strong leader. He was surrounded by advisors with no real authority as a result of the exclusion of the royal uncles. Instead, there were nine councilors, holding office for one year and ineligible for reelection for two years. When he faced the Revolt in 1381, he was not quite fifteen, a boy king with indecisive advisors, no troops, and no money. But he was safe from harm; the rebels wanted protection for their village communal rights against the nobles and abbots -- not king's head. They wanted to benefit from their labor, not suffer the loss of their king. On June 13, John Ball said mass and preached to the people, expressing their dreams, hopes, and desires. "They stood in the sunlight while birds sang and John Ball talked of justice, of justice they had never known but which seemed at last within their reach." <14> This parochial chaplain attacked both church and state, papal corruption, and the greed and oppression of both nobles and merchants. He was the embodiment of the dreams and desires of the commons, and he knew which words to use in order to stir their minds and hearts. They were ready to meet their king. The rebels methodically destroyed property. They started with the Temple which belonged to the Knights Hospitallers of St. John and was headed by Robert Hales. The next target was Gaunt's Savoy Palace with its treasures, tapestries, furniture, armor, ornaments, and jewels. After smashing the interior, the shell was blown up. The Court in the Tower had to decide on a course of action. A policy of conciliation, dispersal, and negation was selected as the only alternative. They would agree to anything in order to make the rebels go home; then, when the council regained power, all promises would become void. The next day, both sides would meet at Mile End. Time was running out for both sides: how safe would the Court be in the Tower, and how long could the peasants afford to stay away from work? How long could the city workers balance between the peasants and their employers? "The towns rose with the people, for there, too, was poverty . . ." and little freedom. <16> The feudal system was not just a country system. The same idea of privilege and a divine order was present in the towns. In fact, the townsmen wanted to get rid of the middleman (lawyers, nobles, and churchmen) and keep the king in a direct line to the people. The negotiations at Mile End went according to plan. Wat Tyler voiced their demands, Richard agreed, and clerks were ordered to draw up the charters. Tyler demanded the abolition of serfdom, the purchase of land at four pence an acre by free tenants, freedom to buy and sell goods, power of punishment over unpopular ministers in the Tower, and a general pardon. After the appropriate hesitation, Richard agreed. Archbishop Sudbury and Treasurer Hales were beheaded as the clerks worked on the charters. The scheme to overtake the rebels would be completed at the next meeting of rebels and the king at Smithfield. There were pockets of continued resistance, but the renewed confidence of the nobles proved to be too strong, especially when combined with superior military force. For example, the Essex men dug ditches and waited for the royal forces on June 27. Over 500 were killed during the fiasco. John Ball was captured in Coventry, taken to St. Albans, and tried on June 13. He admitted to writing insurrectionary letters to commons, expressed no regrets, and refused to ask for a pardon. His sentence was to be hanged, drawn, and quartered - the usual sentence for traitors. He died that horrible death on June 15. Very slowly, the main areas of revolt were brought under control: York, Devon, Berkshire, Hampshire, Wiltshire, Somerset, Sussex, Yorkshire, Lancashire, Lincolnshire, Huntingdonshire, Warwickshire, Northamptonshire, Leicestershire, Kent, Essex, Suffolk, Cambridgeshire, Norfolk, Surrey, and Middlesex. The commons could not hold onto what they had gained for several reasons. First of all, workingmen would not remain in the army. Second, they were untrained and unable to stand up against the royal troops. Third, they relied on sheer numbers. Fourth, they had been fighting in the name of "King Richard and the True Commons," and he had betrayed them. Consequently, the repression continued. On the surface, the rebellion seems like a failure, and in fact, the immediate results were negative. The serfs and the workmen were in a worse position: manorial services were more severe, and the commutation of labor services for money payments slowed. However, the 1381 Peasants' Revolt made men more aware, aware of their market value as laborers, and the importance of community. Economic development itself aided the abolition of serfdom with the growth of towns, commerce, and industry. The rebels did not win but they did not lose. Previously unarticulated ideas about medieval man's rights and his desire for freedom and fairness were articulated during the revolt. It is ironic to think that these peasants were fighting against corruption in government (in addition, of course, for the abolition of serfdom, etc.) in the name of the king, but it was treachery, deception, and betrayal on the part of the king that destroyed their leader and their ability to fight. However, the Revolt served a purpose in the long struggle out of the belly of feudalism and into the modem age with its greater freedom. 2 Norton Downs, Documents in Medieval History (New Jersey: D. Van Nostrand Company, Inc., 1959) 57. 4 Lindsay and Groves 60. 5 Lindsay and Groves 63. 6 Lindsay and Groves 64. 7 Sir John Froissart, Chronicles of England, France, Spain 2 vols. trans. Thomas Johnes (London: George Routledge and Sons. 1874) 1:652. 8 Lindsay and Groves 79. 9 Lindsay and Groves 66. 10 Guy Fourquin, The Anatomy of Popular Rebellion in the Middle Ages, trans. Anne Chesters, ed. Richard Vaughan (Amsterdam: North-Holland Publishing Co., 1978) 140-141. 11 Lindsay and Groves 82. 12 Lindsay and Groves 90. 13 May McKisack, The Fourteenth Century 1307-1399 (Oxford: Clarendon Press, 1959) 411. 14 Lindsay and Groves 100. 15 Lindsay and Groves 105. 16 Lindsay and Groves 112. 17 M . Beer, The General History of Socialism and Social Struggles (New York: Russell & Russell, Inc., 1957) 53. 18 Lindsay and Groves 170. 19 Lindsay and Groves 176. The Peasants' Revolt started in Essex on 30 May 1381, when a tax collector tried, for the third time in four years, to levy a poll tax. Richard II's war against France was going badly, the government's reputation was damaged, and the tax was 'the last straw'. The peasants were not just protesting against the government. Since the Black Death, poor people had become increasingly angry that they were still serfs, usually farming the land and serving their king. Whipped up by the preaching of radical priest John Ball, they were demanding that all men should be free and equal; for less harsh laws; and a fairer distribution of wealth. Soon both Essex and Kent were in revolt. The rebels coordinated their tactics by letter. They marched in London, where they destroyed the houses of government ministers. They also had a clear set of political demands. On 15 June, the 14-year-old king, Richard II, met the rebels' leader Wat Tyler. William Walworth, the Lord Mayor of London, attacked and killed Tyler. 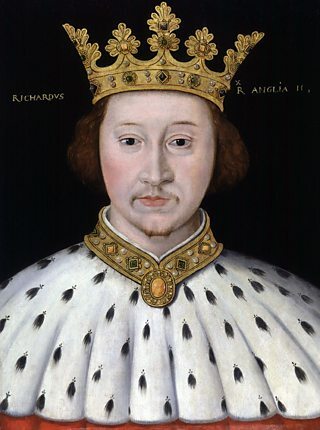 Before the rebel army could retaliate, Richard stepped forward and promised to abolish serfdom. The peasants went home, but later government troops toured the villages hanging men who had taken part in the Revolt. Although the Revolt was defeated, its demands – less harsh laws, money for the poor, freedom and equality – all became part of democracy in the long term. The Peasants' Revolt was a popular uprising. In its demands for rights and equality, it was similar to the Chartists of the 19th century and the Suffragettes of the 20th century - both of whom campaigned for greater political rights - except that, remarkably, the Peasants' Revolt happened six centuries earlier!